Perennial. Zone 4. Liliaceae. Syn. Allium albopilosum. Originally native to Iran, Turkey, and central Asia – general region of ancient Persia. This lovely plant has been grown in western gardens since its first introduction to England in 1884. I first grew this beautiful ornamental onion over 20 years ago, and I well remember how the reality of it exceeded my already high expectations. It is a wonderful thing. 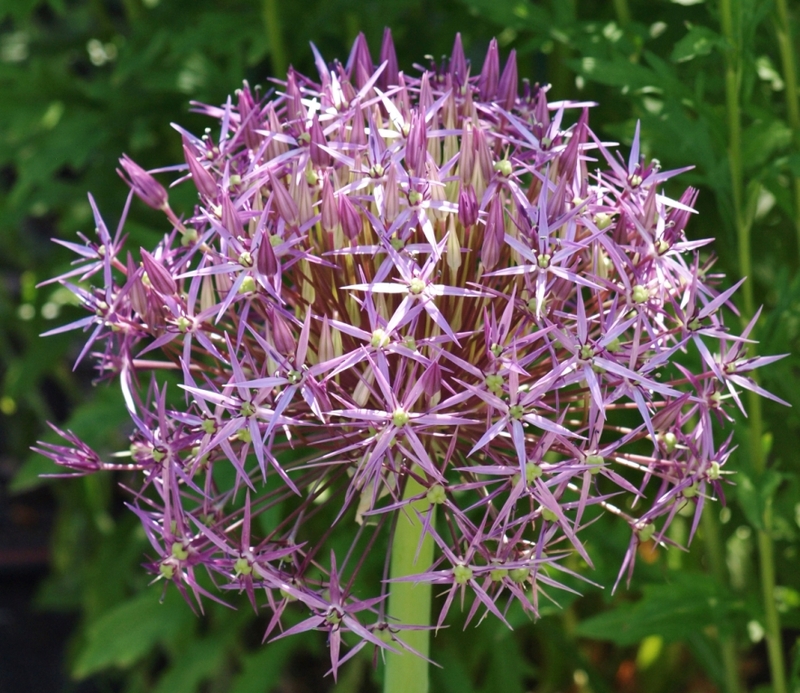 This is a spectacular allium, gorgeous in all its stages, bud to bloom to seed head. 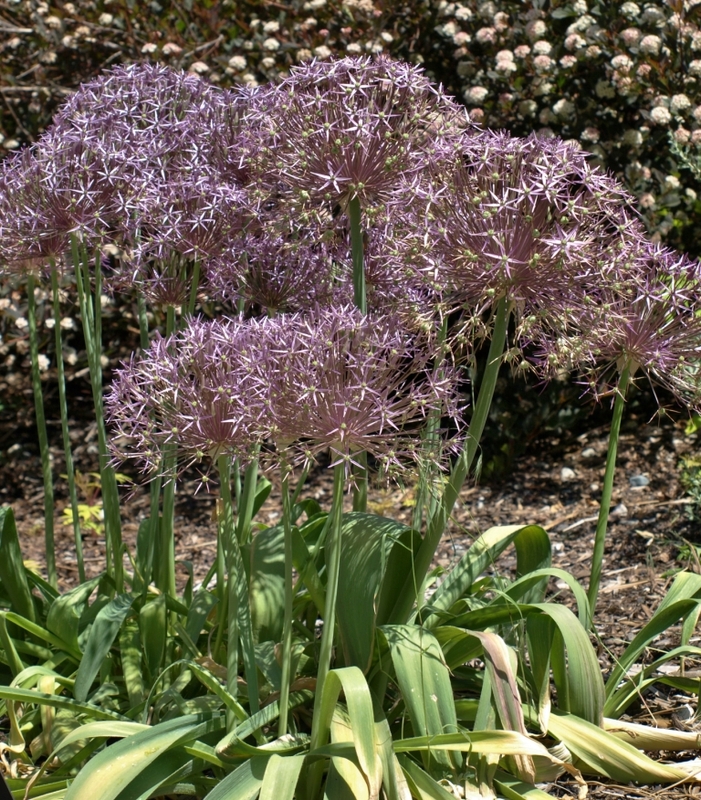 Clumps of long (to 20 inches), grey-green, strap-shaped leaves appear in early spring, soon followed by 12 to 24 inch stalks topped by a quickly expanding sheathed bud, which explodes in late May into a huge bloom cluster – up to 12 inches in diameter – which consists of many pale lavender star flowers. These continue to look good for weeks, gradually transfiguring into plump green seed pods, which can be left alone to eventually dry in place, giving a rather surreal accent to the border. (Or they can be harvested just as they start to turn yellow and hung to dry as unique everlastings.) The fresh and green seed stage blooms are wonderful as cutflowers, too. The foliage quickly withers and is gone by midsummer, by which time other plants have filled in to hide the yellowing leaves. Where happy, on well-drained soil in full sun, these bulbs will slowly reproduce to form an increasingly large colony. 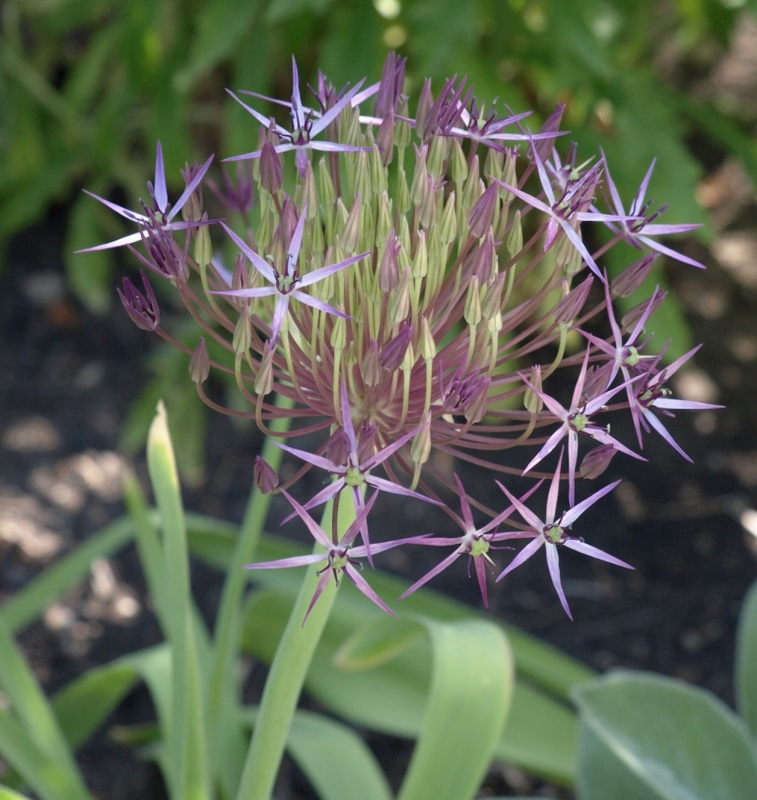 Bulbs may be lifted in midsummer to early fall, and (if they have formed a cluster) separated and replanted. Because of the size of the blooms, it is best to space them fairly generously, up to a foot apart, or a bit closer if you are going for a cluster effect. Sun; average soil & moisture. Quite drought tolerant. Appreciates good drainage.